Hotspot Shield VPN is famous worldwide and boast 600 million users. Why? Because they used to provides a free VPN service which was very easy to use. And free. These days, they only offer a free trial. But still have millions of satisfied users. So you want to know if VPN Hotspot is reliable and suitable for all? Indeed, the location of their headquarters in the USA has to raise suspicion, as they’re part of the Five Eye countries and an enemy of the Internet… Keep reading my Hotspot Shield review in details to find out. 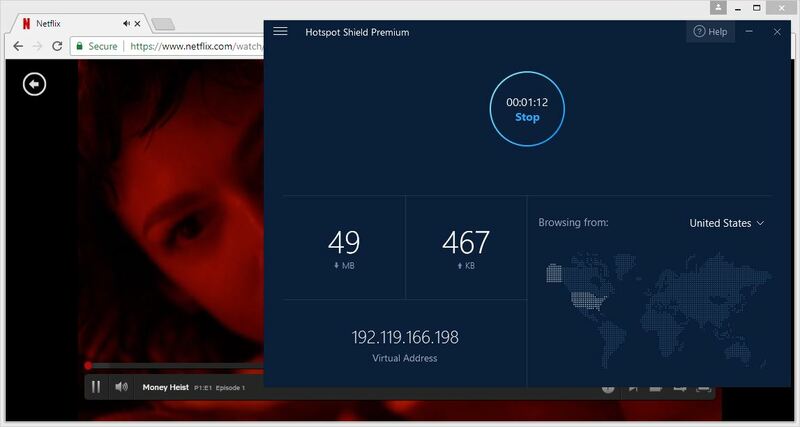 A Dutch friend of mine, who’s not an experienced user (far from it), has been using Hot Shield for a while. So I was curious to know the reasons behind his choice. He told me that he simply found it on Google. And after reading a review on a Dutch website, he decided to give it a go with the Hotspot Shield free download. Because you can easily get it for free, unlike some other providers. And since then, he’s been happily using it. Since millions of people use this VPN, I decided to give it a try too. The VPN Hotspot is offered by AnchorFree, a company with offices in Redwood City, California and in Zurich, Switzerland. And their team is composed of industry thought leaders, technology investors, entrepreneurs, and engineers. The first thing I noted is their great marketing strategy. Indeed, they clearly focus on casual users. People (like you maybe?) who want a plug and play VPN service. Because for them, the only thing that matters is to unblock restricted websites and protect their privacy. And they don’t want to know how a VPN works. They just want to subscribe to a VPN and install it on their devices to use it on a daily basis. Because they’re aware of the risks on the Internet. And they find the perfect solution with their Hotspot Shield download. I’ve already mentioned the risks of free WiFi, many times. And these beginners represent perfect targets for snoopers and hackers. A VPN that is easy-to-use, fast, secure, and reliable is the perfect tool for them. Furthermore, Hotspot-Shield offers native apps for most platforms. And those are really simple to use! Because you don’t even have to choose a server to protect your mobile device, the app manages this for you. Now that Hotspot Shield free VPN proxy is no more, let’s start with Hotspot Shield free trial. Indeed, on their website you can get the Hotspot download and use their VPN for free, with their 7-day free trial. And if that’s not enough for you, you can keep using it risk-free for 45 days with their money-back guarantee. So you can really have time to make up your mind. HotspotShield generally offers 4 packages: 1 month, 6 months, 1 year or 3 years. And the longer you subscribe, the higher the discount. But they’ve granted me and the readers of this blog an exclusive offer with over 70% discount on a 2-year contract, which is their best deal of course. To enjoy this limited-time offer, you need to click here and subscribe. Great news! The VPN Hotspot allows user to watch American Netflix, with a great picture quality. However, it doesn’t work with the British library. So if you’re an expat, this may not the best solution to get UK Netflix. And another good news: The service is torrent-friendly. So you can connect to download torrents anonymously. And I remind you that users have unlimited data bandwidth. So you can download as much as you want! Also, the company offers a zero log policy: They don’t log or store your IP address, deleting it on the fly. 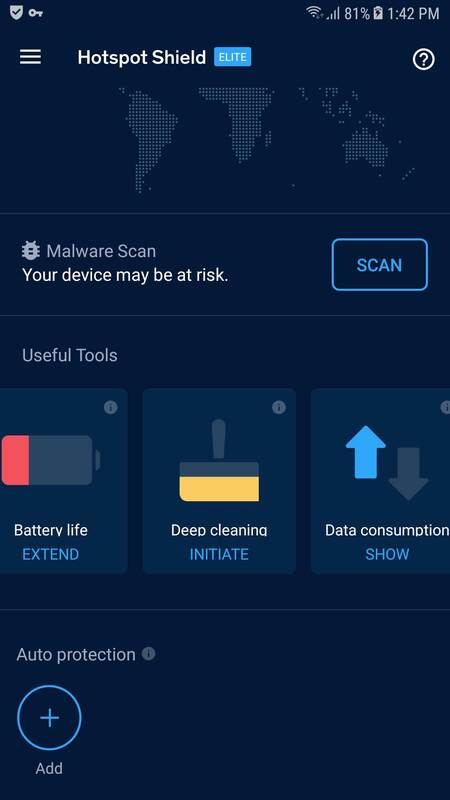 HotSpot Shield VPN is targeting people who aren’t tech savvy. And people who’re looking for an easy-to-use, fast, secure, and reliable VPN and proxy service for anonymous and secure browsing, fast performance streaming, access to global content and Wi-Fi security. It’s extremely easy to install and set up a Hotspot Shield VPN free: No configuration is required. All you have to do is connect with one click. And as I said, the client that is easy to use. And I was impressed by how fast it connects to the servers, with this latest version. Once you launch the software, it connects you automatically to the US server. And you can disconnect by clicking on Stop – reconnect by clicking on Start. Simple as pie! From here, you can quickly and easily change your server location whenever you please and view the amount of data that is being uploaded and downloaded. If the connection is unprotected, a red bar appears across the screen to let you know. While you can change the server, you can only do so when connected, from the drop-down list on the right side of the client. And when you click on another server, it connects you within seconds. 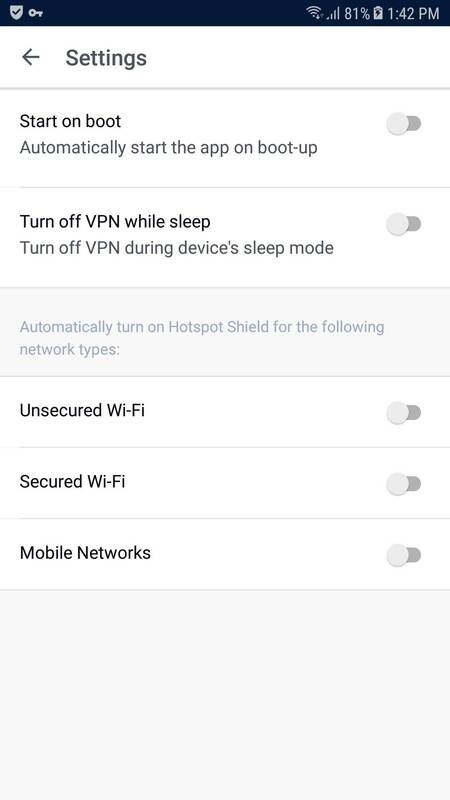 The settings of VPN HotSpot are really limited – you can’t change the protocol. BUT I really appreciated that the IP leak and Unsafe WiFi features are enabled by default. Because these are important and casual users may not even know about these! Maybe they could have done the same with the Kill Switch. First of all, don’t get too excited. Because it’s just the name of their proprietary VPN protocol. And not some catapult to throw away Hydra criminals… They’ve filed over 30 patents for this protocol. And it improves performance over long-distance connections, by compressing your data. As a result, you can enjoy its ease of use and decreased time to establish the VPN connection. While they don’t share the “secret sauce” of their protocol, they told me that their performance advantage comes from how the payload is delivered inside the secure tunnels between the client and the server. I’ve mentioned the Kill Switch feature above, in the settings, that’s not activated by default. And it’s a crucial feature for users who download torrents and watch streaming videos. Because it blocks the internet traffic if your VPN connection drops unexpectedly. And that can happen, unfortunately, even with the best VPN. So if you’re in this situation, the Kill Switch prevents your IP address to be in the clear. And your privacy is safe. 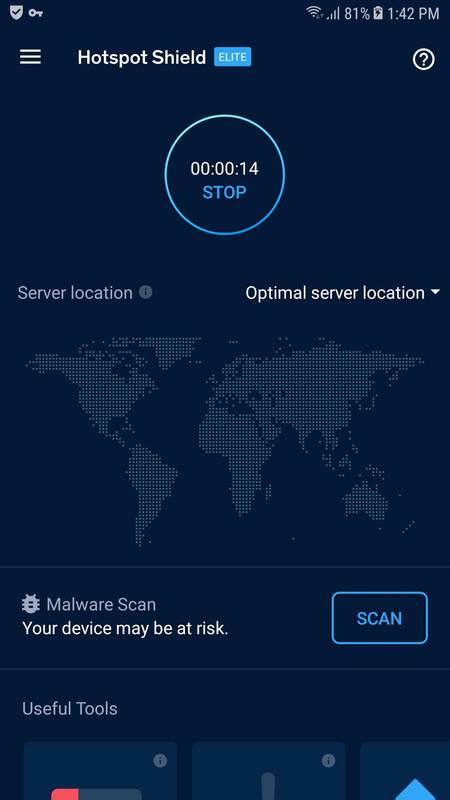 Hotspot Shield VPN includes an efficient protection against DNS leaks, that’s activated by default. And it prevents your Operating System to send requests outside the encrypted tunnel. Because otherwise your IP would be in the clear, even with the VPN connection… But the Prevent IP leak setting ensure that all your requests pass through the VPN tunnel. You can get the Hotspot Shield app from iTunes, Google Play to use the service on iOS and Android devices. And for your computer, you can download it and set up an account for your Windows or Mac. The very good news is that the mobile application is always very simple. It’s basically the same as what I’ve described above for all platforms. So, even if the user is a noob, it’s not a struggle to connect to this VPN on mobile. Hotspot-Shield has a dedicated live-chat tech support. But it doesn’t operate 24/7. You can also contact them by email where I received helpful responses. And there’s an FAQ page, where you’ll find helpful information regarding the proxy service and its usage. Finally, you’ll find detailed instructions that walk you through set up, usage, and uninstalling the service on their online forum. Hotspot Shield is a plug and play solution for basic users. It's intuitively designed and easy to use. And its impressive speeds is a stand-out feature you'll appreciate. It includes top-grade encryption protocols for excellent privacy and data protection, including malware protection to boot. This VPN solution is suitable for all those who want to encrypt at low cost, to watch streaming TV and download torrents on all their devices without limits. Don't expect too much on the settings, though.